There're a LOT of tiny triangles in this STL. 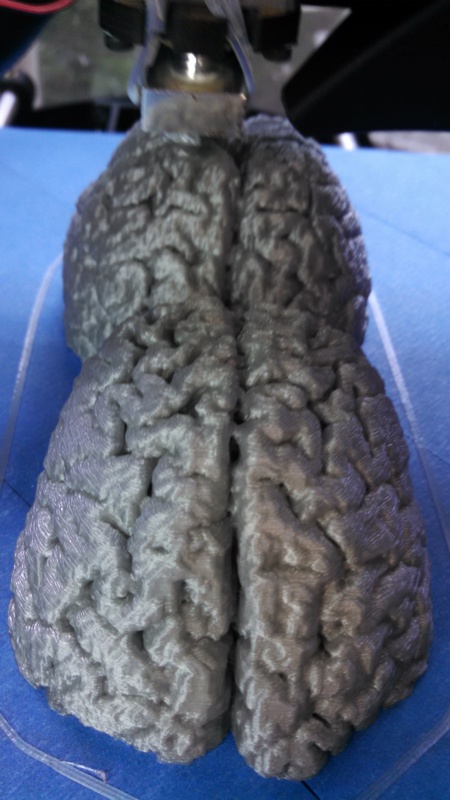 To avoid the support messiness, I halved the brain at a rough 45 deg angle to allow printing on a flat surface. Serendipitously, the two halves will sit flat, resting on the lower aspects of the halved temporal lobes. The initial print was printed 1/2 size, without other modification to the STL and took approximately 21 hours. I have since halved the model and filled some of the internal sinuses to minimize unnecessary and unseen details. I also know a neurologist who might enjoy a sliced version of this MRI, maybe mounted on some nice oaken stand. Printed with a Lulzbot Taz4, 0.25 mm layers, 10% hex infill. but with all the internal cavities, it's very dense. Schlem, thanks for taking the time to make this printable! We'll be implementing "versioning" in the near future so that you can upload your modified STL. In the meantime, you can edit the build and upload the gcode file if you have it. Happy to add other useful file formats so that users have a pre-sliced printable file.